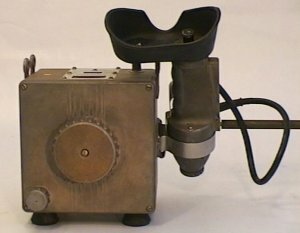 Grey metallic control box containing galvanometer, standard cell, four dry cells, resistors, two slidewires and knobs; connected to a scope by black cable; scope consists of lenses, switch, filament, lamp and a means for focusing. Current from the cells act upon the set of resistors. One of these, R2, is variable and can be controlled by the use of the large knob on the side of the box. The scale of R2 is calibrated in degrees Celsius, and is carried with its dial. As the resistance is varied, the filament in the scope alters in brightness until it matches the source, leading to the term "disappearing filament pyrometer". Temperature is read directly from the scale. Designed to be portable, this model is missing the carry strap. It measures a temperature range from 775-2800 degrees Celsius. Wood, W.P., Pyrometry, McGraw-Hill Book Co., 1941, pp.114-116.